Rebecca Emiah, OD, joined the optometry section of Emory Eye Center in August 2017. She sees triage and post-operative patients, performs hospital consultations, and works with those who need specialty contact lenses. Dr. Emiah received her undergraduate education at Grand Valley State University, where she earned Bachelor of Science degrees in both Biomedical Sciences and Cell and Molecular Biology. She then studied optometry at the Michigan College of Optometry and graduated in 2016 with her Doctor of Optometry (high honors). Following optometry school, Dr. Emiah completed a one-year residency with Georgia Eye Partners in ocular disease and ocular and refractive surgery. 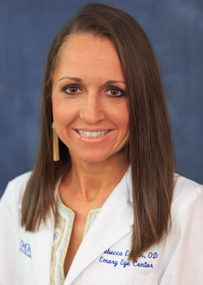 She has treated patients with complex cornea, dry eye and glaucoma issues. She also has experience fitting and prescribing specialty contact lenses and co-managing postoperative patients following cataract, LASIK, PRK or other procedures. Dr. Emiah is a member of the Beta Sigma Kappa International Optometric Honor Society. She has presented research to the American Academy of Optometry regarding higher order aberrations and contact lenses.